In my 20 years in the industry I’ve been asked thousands of questions about Advanced Motorcycle Training. Our aim with the information here is to provide the most popular questions and the answers at a glance. There is no particular order to follow. Do I have to do advanced motorcycle training? Absolutely not. Beyond the licence acquisition test (the ‘L” test), there is no requirement for anyone to take part in further training. What is the difference between Observing, Coaching and Training? Observing is a mostly passive process seeing what you do and offering helpful suggestions for you to take on board. Training is much more pro-active and is the art of instilling best practice by a combination of theory, demonstration, emulation and practice in controlled circumstances. Coaching is also a proactive process with feedback and building on the skills gained from proper training to a level of competency. Proper training and coaching are a short cut to skills, best practice and good habits. There’s lots of people who can give advice about riding a motorbike so why would I pay you? Advice is always something that people seem happy to give freely and it is very different to coaching or training with a professional. Free advice is nearly always worth what you pay for it, but can lead to disastrous consequences if you fail to understand the context and theory behind the advice. Do I need a full motorcycle licence? Yes, advanced motorcycle training is recognised as being for all riders with a full licence. You will be riding at a higher level and with more fluency than you are now. I think I’m as good as anyone else so why aren’t they doing it? We all like to think that we are capable riders and maybe we are. But, advanced motorcycle training isn’t so much about how good you are now or how good anyone else is, it’s about developing your competence and skills to the highest level possible. I’m a good rider so what do I benefit from by paying you? There is published industry knowledge showing that most riders think they are better than the average rider. We can’t all be right. in fact, our own survey of riders showed that 85% of riders think that they don’t need any further training but they all know a rider that does. Interesting don’t you think? At the risk of sounding like I’m bragging, but you did ask….I have industry specific qualifications that take time to develop the necessary skills to pass. Not only that, they are independent to any association I may have with motorcycling organisations. I got top marks for my riding and teaching in all categories of the Post-Test training test held by the Driver and Vehicle Standards Agency. 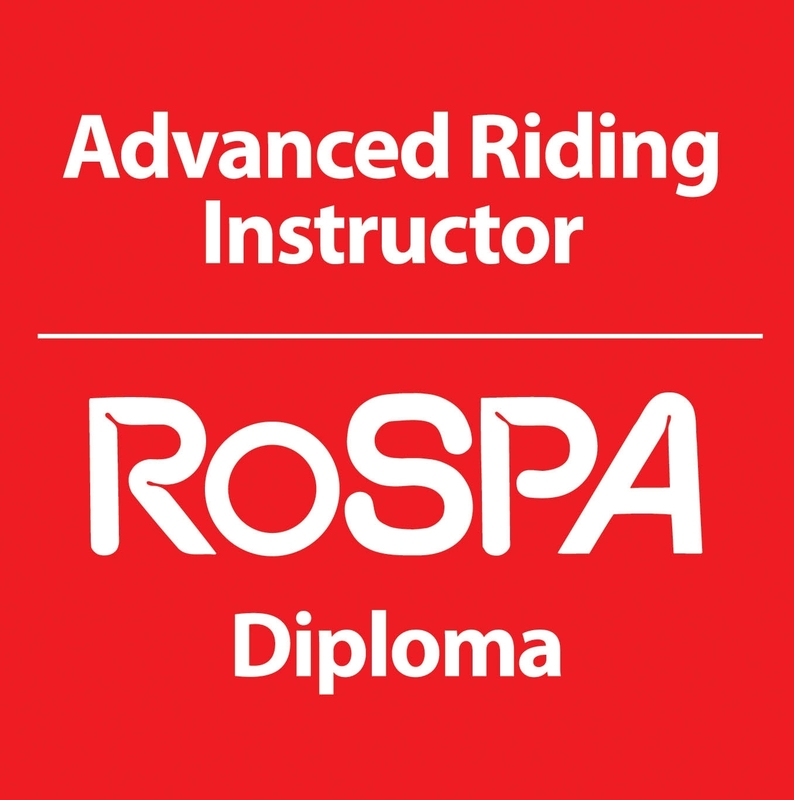 I hold an Edexcel BTEC teaching award for advanced motorcycle training, a RoSPA Advanced Instructor’s Diploma in which I gained 98% for my riding test and 93% for my coaching. This is equivalent to Distinction standard. Yes, I spend my life riding a motorcycle. I have about 40,000 hours on road teaching experience in all kinds of conditions. Will I have to go fast and pursue people in the advanced test? No, absolutely not. There is confusion about advanced riding but it definitely doesn’t involve pursuit. The police always look good when they’re riding. Is that advanced? Yes, they ride to a system that each rider has taken time to learn. If you want to ride like that I can teach you. I don’t want to ride like a policeman, I just want to improve a bit. That’s great. Advanced motorcycle training is about personal development and you can have as much or as little as you want. I’ve been told that all training is good training. I can only think that this is a general term meant to be encouraging rather than a fact. The reality is that poor advanced motorcycle training is worse than having none. In my experience as an Expert Witness, in all cases, a significant contributory factor to the situation was either a lack of, or poor training either by the ‘instructor’ or the rider. That depends on how you value the price or the cost. The lessons are very reasonably priced and on a professional level as with many other professional services. Training with us will reduce your risks and the cost may be much less than you might ultimately pay. Why are you different to the IAM? The IAM is a road safety organisation. As an organisation there is some good information to be gained from them. I’m a professional trainer and my time is dedicated to advanced motorcycle training. I get worried when cornering, is this something you can help with? Absolutely. Our Get-Cornering module is exactly designed to help riders negotiate bends safely and with confidence. It is important to note that cornering skills on road are different to those required on the track. Our course is road focused. Will I have to wear a yellow bib? No. We want you to turn up and ride in the kit you normally ride in. Do you have radios for communication? Yes, all our training is done with good quality radio communication. My mates are faster than me and told me to get some training. That’s a really interesting point you make. I can’t comment on your mates’ riding but I can say that a number of riders who have been on our courses already ride quickly enough but think that they don’t. My mates tell me that I’m doing quite a few things wrong. Will advanced training help put this right? Well that depends on whether your mates are qualified to tell you what you’re doing wrong? My suggestion would be to come along for our riding assessment and we can point you in the right direction with your understanding. I was chatting in the pub and a couple of guys were saying that I ride too fast. What am I doing wrong? Without seeing you ride I can’t say what may be right or wrong. Come along for an assessment and let’s put your mind at rest. My observer told me that there’s no such thing as counter steering, is that right? He said it was called positive steering and I was confused. No it’s not right and counter steering is recognised across the whole motorcycle world as the way to extract more turn from a motorcycle. There’s a new gimmicky phrase in the UK industry called ‘positive steering’ which from my experience has done nothing except have a negative effect on the person trying to understand what it means! I was told that I don’t make progress. Can you help with this? Yes, come along for an assessment and let’s get to the understanding as to why this may or may not be the case.